A recent study of preschools by Michigan State University shows that only 42% of preschools engage children in science activities. We do science on a steady basis! 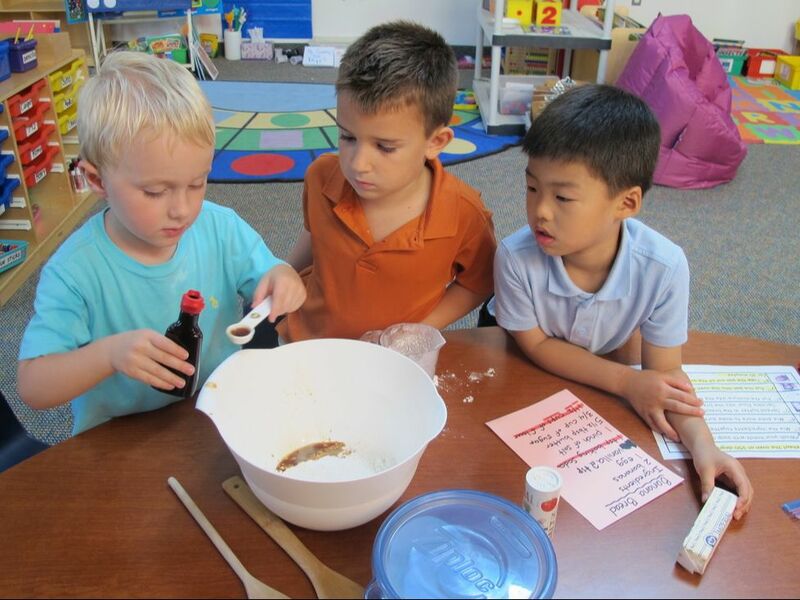 Cooking gives children a chance to follow directions, count, measure, plan ahead, and enjoy the outcome of their work! First, as a class, we read the funny story about Mr. Archimedes and his bath. Then, in small groups, the children predicted and checked the “float-ability” of many classroom objects. 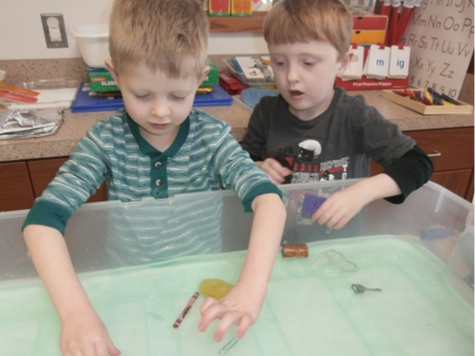 After that, they tried out the Archimedes Principle as they added and subtracted toy animals from a container of water and observed the water level rising and falling. 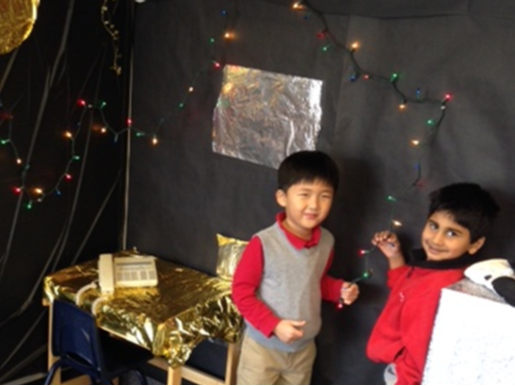 Later, the small groups shared the scientific principles they had learned with other groups. Please click on this funny video (above) to see our preschool students as they get together in the middle school science lab to learn about chemical reactions. They love being in the big-kid spaces. 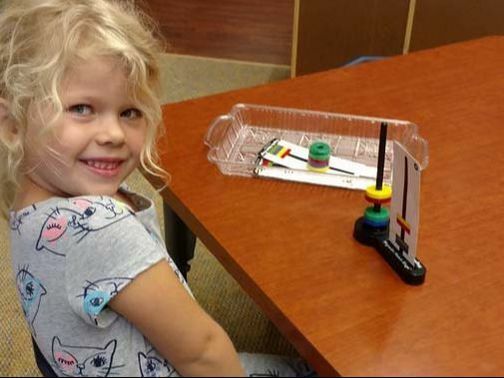 Children explore and observe magnetism by stacking magnets according to a color pattern. We learned about the skeleton, major organs, veins and muscles in our bodies. 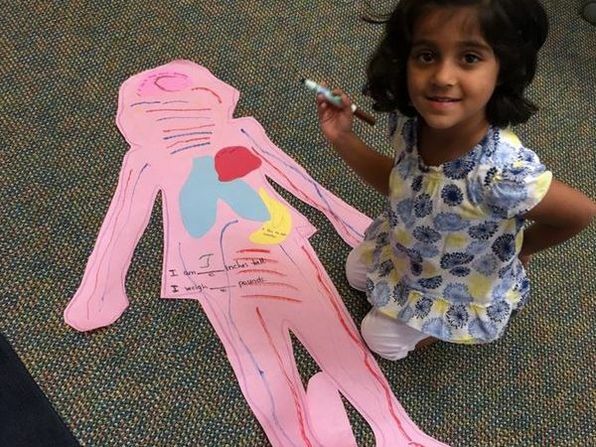 Then, we drew something we like to think about in our brains, something we like to eat in our stomachs, and something we love in our hearts, and we glued these things to our paper bodies. One of the most interesting things we learned was that our hair and our fingernails are made of the same protein! This group of preschool children developed an interest in the night sky, so we watched YouTube videos and memorized songs to learn the names and the order of the planets. We also learned many space facts. For example, we discovered that Jupiter's big, red spot is a constant storm that has been storming for hundreds of years. In this picture, the boys are in their space station.